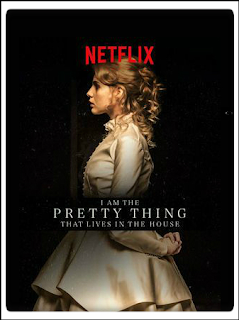 I made time to watch I Am the Pretty Thing That Lives in the House and I'm glad I did. Let me start off by saying a BUNCH of people are going to HATE this film. It's been my experience that when a film is a slow, slow burn people detest it. When it takes it's time and drifts around a bit with no jump scares or super loud music ques to pop them away from time to time, they moan and grumble about it being boring like a petulant three year old in line at the grocery store. However I love these films. I sink in and snuggle in to them like I'm huddled in a warm blanket. 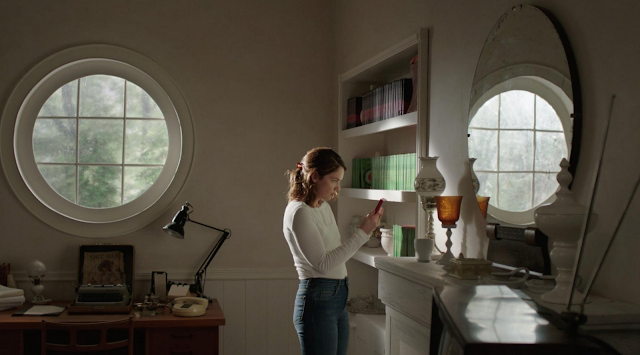 Films like The Innkeepers and other Ti West fair and lovely, novel-like dreams like The Last Will and Testament of Rosalind Leigh make me incredibly happy in their quiet, calm pace. It really is a little like reading a good book to me. I Am the Pretty Thing That Lives in the House is just that in spades. The film tells the tale of Lily (Ruth Wilson), a nurse taking care of an elderly writer named Iris Blum (the wondrous Paula Prentiss). The house was built ages ago and has a secret. Standard stuff here, of course, but the cast of six makes it interesting. It's a gothic haunted house tale, but the delivery is what makes it something I found to be all at once creepy and beautiful. Prose opens the story and should act like a weeding out process. If the glacier-like pace of the intro bothers you, just wrap it up and stop watching because the whole of the film is the same way really. Lily putters around the house and takes care of Iris, but slowly comes to realize that there's something other than the two of them present in the home. A small mystery for Lily to look into while she tries to keep herself busy, things rapidly escalate and twist into something surprisingly effective. And....thank you Oz Perkins for your grand story and simple direction. We're allowed to roam through the old house with Lily - sweeping along bright hallways and empty rooms, but are never smacked around with bombastic scores, audio assaults to underline horror elements, or hyper-kinetic camera moves to emphasize distress. We're just shown what we are meant to see. And that in and of itself is very creepy, brooding, and gloomy in a wondrous, gothic way. Netflix knocks out another fantastic original offering! If you want a great story in the vein of classic haunted house stories of the past - along the lines of the fantastic works of M. R. James, please give I Am the Pretty Thing That Lives in the House a watch and let me know what you think. Currently available on NETFLIX.